It wasn’t the first massed-produced chocolate chip cookie—that honor goes to Nestle Toll House for its late-1930s version—but it is America’s best-selling one. 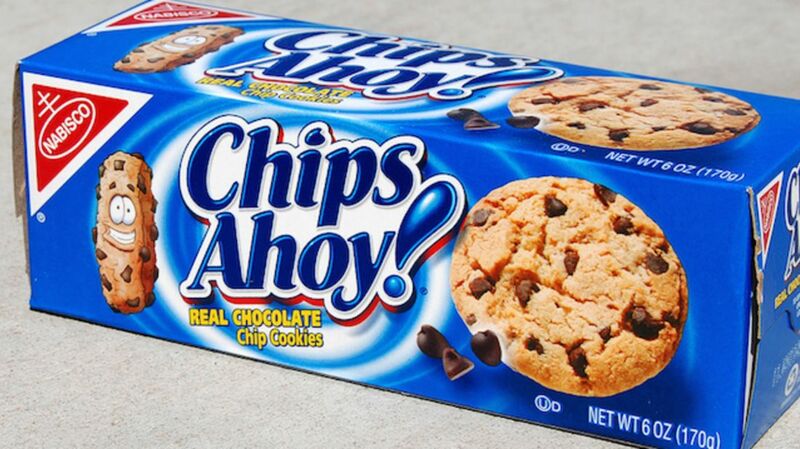 Since 1963, Nabisco’s iconic Chips Ahoy! has been at the top of the cookie game thanks to a combination of clever marketing and straight-up scrumptiousness. And though it's a favorite for both kids and adults, here are 12 facts about the treats we bet you didn’t know. 1. CHIPS AHOY! MAY HAVE GOTTEN ITS NAME FROM CHARLES DICKENS. OR DONALD DUCK. Nabisco has only ever said that the name was inspired by the nautical term "ships ahoy." But the play on the phrase does have precedent: An 1859 story in Charles Dickens’s The Uncommercial Traveller includes the passage, "Chips ahoy! Old boy! We've pretty well eat them too, and we'll drown the crew, and will eat them too!" Walt Disney jumped on board, too, with an animated Donald Duck short of the same name in 1956. 2. 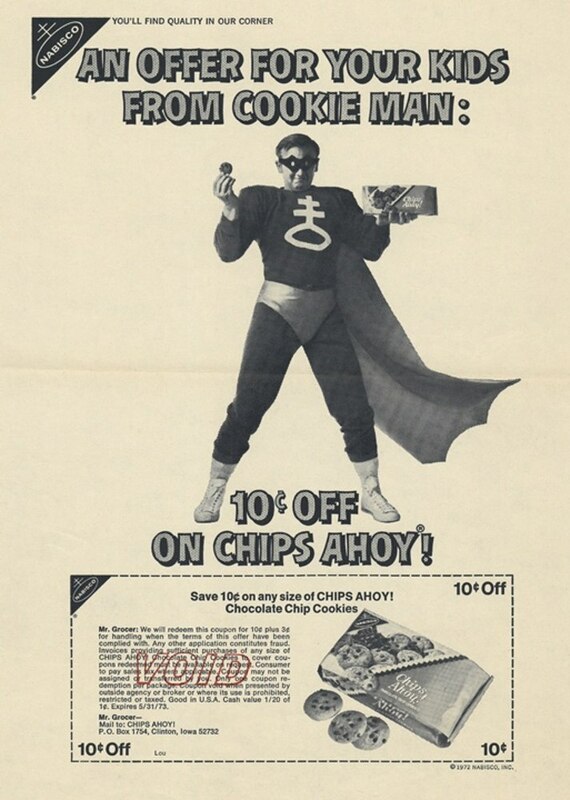 THE ORIGINAL MASCOT WAS CALLED COOKIE MAN. The first Chips Ahoy! mascot was a live-action superhero named Mort Meek, whose antics appeared in comic strips on packaging and on TV spots during Saturday morning cartoons. The storylines often portrayed Mort Meek enjoying all "16 chocolate chips" in his cookie when a thieving villain with a sweet tooth would attack. Mort Meek would slip away, Superman-style, and reemerge as Cookie Man to save the day. 3. IN THE 2000s, COOKIE MAN WAS REPLACED BY COOKIE GUY. After a decades-long absence, Chips Ahoy! brought back their mascot in 2002, this time in the form of animated cookies. They also tweaked the moniker and, in 2014, debuted a more humanlike form of Cookie Guy (one who walks with legs, rather than just gliding around) to better reflect what a spokesperson told The New York Times was the brand’s “lighthearted, playful, [and] slightly mischievous” spirit. The rule-breaking Cookie Guy pulls all sorts of rogue antics, from walking through doors that explicitly say "No Food Allowed," to ever-so-slightly disturbing a "Do Not Disturb" sign. 4. THERE ARE ACTUALLY FIVE COOKIE GUYS. Or so claims Nabisco’s parent company, Mondelez International. The five “guys” that make up the cookie gang are Chipper, Soft, Stroppy, Chunky, and Cheeky. 5. JOEY LAWRENCE STARRED IN AN EARLY COMMERCIAL. Before he was Blossom’s big bro (and your middle-school crush), Joey Lawrence was a child actor just tryin’ to earn a buck. In an early-'80s spot, he comes home from school embarrassed, whining that a classmate kissed him in front of everyone. His mother consoles him with a plate of milk and cookies, as one does. 6. NEW YORK JETS COACH TODD BOWLES IS A HUGE FAN. Cookies, apparently, are the "lone vice" football coach Todd Bowles allows himself. After saying his preferred way to celebrate a win was with a glass of milk and a stack of Chips Ahoy!, the company sent Bowles a care package full of boxes of the cookies, plus a personalized coffee mug to congratulate him on the team’s 3-1 season start last year. Bowles doled out one cookie to each player from his "personal stash" after they beat the Patriots later in 2015. Another athletic fan? St. Louis Cardinals pitcher Michael Wacha, who told a radio show that baseball fans were good with letting him just live his life—and make his cookie purchases. "The fans here are great," Wacha said. "If they do see me out … buying Chips Ahoy!, they don't bother me too much. They just say 'Great game,' or 'Good luck tonight.'" 7. THE NUMBER OF CHIPS IN EACH COOKIE HAS CHANGED OVER THE YEARS. The ads of the 1960s often showed Cookie Man meticulously counting the chocolate morsels in a cookie with the tagline "Chips Ahoy: The 16-chip cookie." In response to increased competition in the '80s, the company began promising 32 chips per cookie (they later scaled that back to 24) and changed the slogan to "Betcha Bite a Chip." By the next decade, Chips Ahoy! was touting the number included in an entire "1000-chip delicious" bag. 8. A BUNCH OF THIRD-GRADERS GOT NATIONWIDE ATTENTION WHEN THEY CHALLENGED THE COMPANY’S 1000-CHIP CLAIM. In 1996, a third-grade class in Wadesboro, North Carolina, counted only 680 chips in a bag of Chips Ahoy! and wrote to Nabisco in protest. The company, in turn, staged a public recount. It turned out that that the kids had only counted the chips on the cookie’s surface; once the cookies were dissolved in water and all of the cookies' chips were on view, the total reached 1181 chips. Sales jumped 20 percent as a result. 9. U.S. AIR FORCE CADETS WERE AMONG THE PARTICIPANTS IN CHIPS AHOY! 'S 1000 CHIP CHALLENGE. Following the counting stunt in North Carolina, Chips Ahoy! launched a chip-counting campaign in 1999, which challenged the public to creatively confirm each cookie’s amount of chips. They attracted entries from, among others, statistics students at the Air Force Academy, who analyzed 42 bags to conclude that 93 percent of them did indeed contain at least 1000 chips. 10. THEY’VE BEEN KNOWN TO INCITE VIOLENCE, BUT ODDLY, ONLY IN ILLINOIS. On at least two occasions, Chips Ahoy! has been implicated in serious crimes. A Decatur, Illinois, woman claimed in 2014 her roommate became hysterical when she ate three of his cookies for breakfast, and subsequently tried to strangle her in the bathtub. Elsewhere in the state the following year, Belleville police responded to shots fired stemming from an argument over $8 and a bag of Chips Ahoy! cookies. 11. BUT THEY'VE ALSO SAVED LIVES. In March 1985, four fishermen were rescued after spending 42 hours adrift in a rubber life raft off of Nantucket. The crew had been forced to abandon its 67-foot trawler after huge waves flooded the boat’s engine room, which proved to be a smart move when the craft sank just minutes later. The four men survived almost two days in rough conditions in part because they had five bags of their favorite cookies to help keep them afloat. After they were rescued, one of the fishermen gave this explanation for their survival: "Everyone did plenty of praying and eating Chips Ahoy! chocolate chip cookies … Without God, and the supply of cookies, I don’t think we would have made it. The cookies saved us." 12. CHIPS AHOY! CAN BE THE BASE ALL OF YOUR NEW FAVORITE RECIPES. Sure, Chips Ahoy! are tasty on their own, but that doesn’t mean they can’t kick it up a notch, too. Mondelez maintains a website full of recipes for snackers who want to use their favorite packaged cookies as a building block for something more ambitious. In the mood for a Chips Ahoy Sweet Plantain Quesadilla? What about a birthday party-perfect Hedgehog Cake? Chips Ahoy! are a surprisingly versatile ingredient.